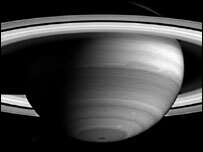 The Cassini probe, en route to Saturn, has taken an amazing image of light and dark banded clouds that characterise the ringed planet's atmosphere. The dark regions are free from high clouds, while the light regions are areas where high, thick clouds shield the dark areas below. The small Saturnian moon Mimas, which is about 396km across, can also be seen to the left of the planet's south pole. Cassini will be brought into orbit around the ringed planet on 30 June. Cassini is the mission's primary probe. In January next year, it will release its piggybacked Huygens probe which will attempt to land on the oily seas of Saturn's major moon, Titan. Mission scientists have been baffled by the dark spot at the south pole of Saturn, because it is so small and centred on the pole. The spot could be affected by Saturn's magnetic field. The cloud bands move at different speeds. This may be due to either the different motions between them or to disturbances below the visible cloud layer.